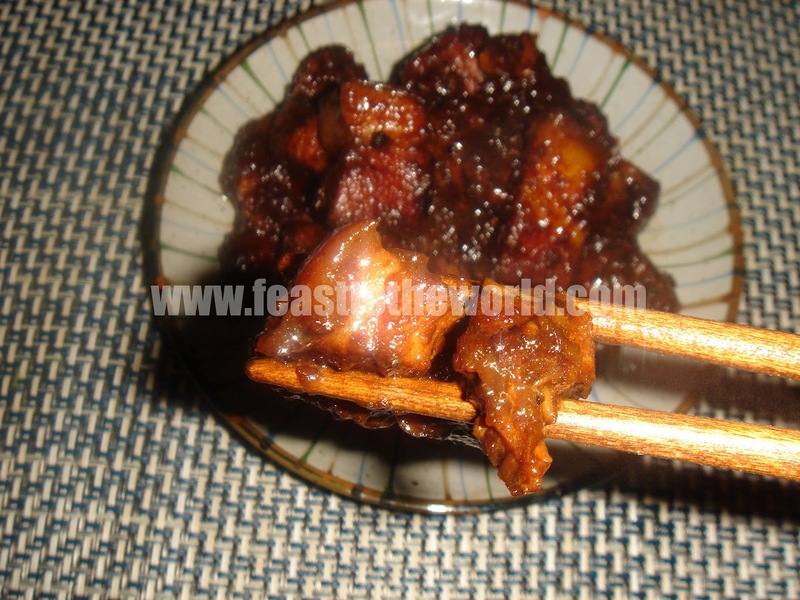 Babi Pongteh is one of the most famous Nyonya dishes in a Peranakan household and a dish I grew up eating loads of. Not entire hard to prepare as the ingredients that required for this are not demanding. Unlike a lot of other Nyonya dishes, the rempah/spice paste which is often seen in a typical Peranakan dish is very much absence here. So no tedious amount of pounding your life away with a mortar and pestle, trying to get the right consistency out of all the chillies, shallots, spices etc. Instead, this dish make use of the fermented soy bean paste or Tau Cheo, which happens to be a very typical Nyonya ingredients too. The pork is braised slowly for a long period of time in the Tau Cheo and dark soy sauce to produce a wonderfully rich and sweet tender meat. The significance of this dish is very apparant from it's vital inclusion in a traditional Tok Panjang. This is a formal dining experience adopted by the Peranakan for any grand celebratory occasions such as weddings or birthdays. The feast will be laid out onto an immaculately presented table and friends and family will be invited to sample the culinary skillfullness of the host. It is also a way for the household to showcase their wealth and fortune as well as upbringing. For a young Nyonya girl, this is the one dish that will be taught to them by their mother with upmost emphasis. It is a tradition for a Peranakan family to determine if a potential Nyonya is suitable for marriage into the household simply by asking her to prepare this dish. Failure to produce a delectable dish that will wow the future mother-in-law will means a rejection to the marriage. So in order to marry well, a Nyonya will have to master this dish. Normally, Babi Pongteh is made with pig's trotters but on this occasion, I've decided to use pork belly which is more accessible. Pork belly is without a doubt my favourite cut of the pig. The beautiful thick layer of fat on this particular cut not only keep it nice and moist when cooked but also give the most succulent and delicious flavours. 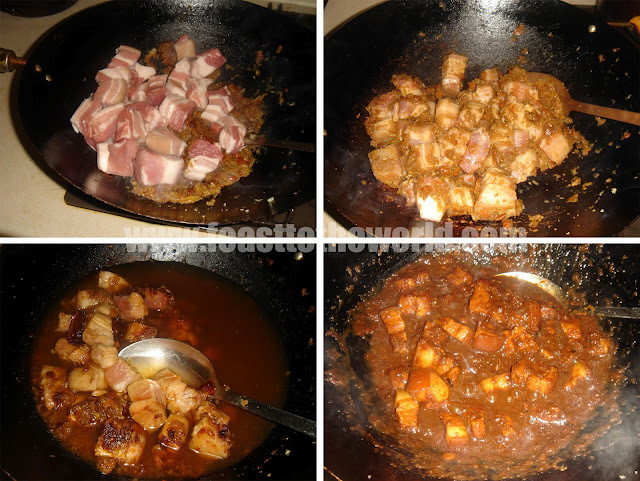 Cut the pork belly into large chunks. Heat the oil in a wok over high heat until smoking. Lower the heat and add the shallots and garlic and stir fry for 1 minute, until golden and fragrant. 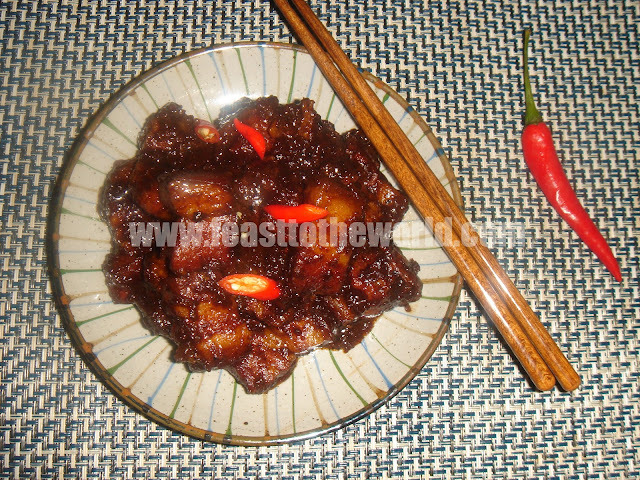 Add the fermented soy bean paste and stir fry for 2 minutes before adding the pork and cook for another 3 minutes. Add the dark soy sauce, palm sugar and the water. Bring to the boil before covering with a lid and simmer for 2-3 hours, until the pork is tender and the sauce has reduced and deepen in colour. Season with salt to taste. Serve with some warm steam rice. This is also delicious the following day. 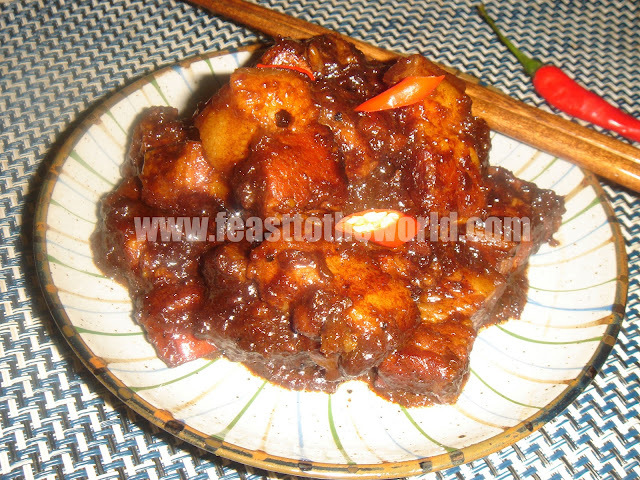 I love ayam pongteh too! Mine is usually lighter in colour though...wonder why? I think Nonya cuisine definitely have one of the most exciting flavours combination out there......Thanks!